Thomas Müller could barely contain his excitement ahead of Bayern Munich's UEFA Champions League semi-final test against tournament holders Real Madrid, with the Bavarian attacker insisting, "the chances look good," for Wednesday's first-leg hosts at the Allianz Arena. Bayern's No.25 was on target for the eighth time in the Bundesliga this season, his 57th-minute goal breaking the deadlock against a Hannover side that eventually succumbed to a 3-0 defeat at the hands of the recently crowned champions. Speaking ahead of his team's mouthwatering semi-final first leg on Wednesday, the self-proclaimed Raumdeuter said that although nobody at the Bundesliga giants would be taking anything for granted, it was hard to ignore the form of a team who have lost just once in their last 26 games and are chasing down a domestic and European treble. 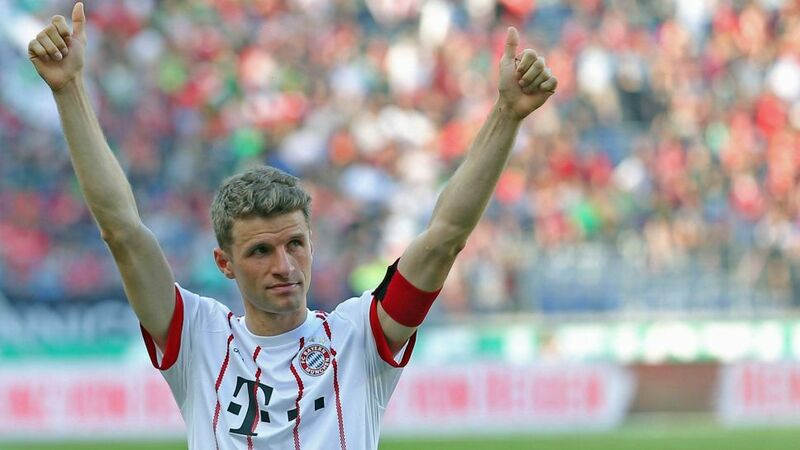 "The chances [against Real Madrid] look good," Müller told bundesliga.com. "We’re not in a semi-final just like that. We’re in a good phase and the game is coming at the right time. What the result will be is something we’ll have to see. I’m sure we won’t be gifted anything but there’s something in the air right now." Bayern are facing their Spanish opponents for the seventh time in a European Cup semi-final and Jupp Heynckes' side rule the tale of the tape in terms of meetings at this stage of the tournament, having previously advanced past Real and onto the final on four occasions. Following Wednesday's fixture, the teams will meet in the Spanish capital for the second leg on 1 May.